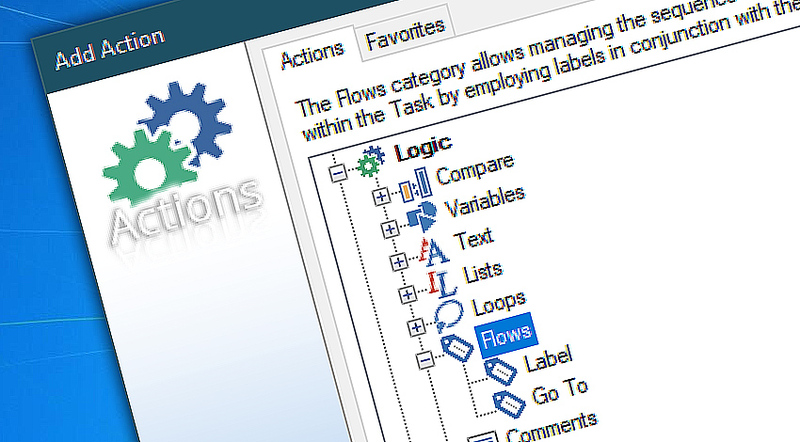 The Flow category features Actions that create functional labels in the workflow and redirection operator. The workflow can be directed to particular Label, thus altering the linear order of Actions. In conjunction with conditional operators these Actions allow to efficiently control the workflow. Deploy Labels and Go to redirection operators to enable Task to transfer control to another Action in the workflow at specific points or conditions. Label can be inserted anywhere in the workflow to mark a point to which workflow can be redirected. A Task can contain multiple Labels that each introduces a specific section of workflow. Go to redirector jumps directly to specified Action or Label and skips everything inbetween. Can be paired with conditionals that specify the criteria of redirection. Label · insert labels in the Task to which the workflow can be redirected. Go to · redirects the workflow to a specific Label or Action in Task.